Azoles are important agricultural fungicides and we have indicated above some of their uses. Although the search for new azole fungicides is an active research area, particularly for the more damaging plant pathogens such as the causal agent of rice blast disease, Magnaporthe oryzae (Mares et al., 2006), use of clinically useful antimicrobials in agriculture reduces their value in the clinical setting because broadcast application (for example by aerial spraying or dusting of crops in the field) exposes enormous populations of microbes to selective pressure for antibiotic resistance. The mechanism of action of all antifungal azoles is based on inhibition of the fungal cytochrome P450, sterol 14α-demethylase, to block biosynthesis of ergosterol. This enzyme activity is present in many other species, including humans, to metabolise the same substrate (lanosterol) to cholesterol, so one of the requirements for the antifungal azoles is to inhibit the fungal pathway but avoid or minimise inhibition of the human enzyme (Mast et al., 2013). Field acquired resistance is a particular problem for antibacterials where horizontal transfer of plasmids carrying resistance can communicate field acquired resistance to commensals and pathogens in the human population. The problem is no less acute in fungi. Horizontal transfer of resistance on plasmids does not occur but so many of the most troublesome opportunistic fungal pathogens are common soil and environmental fungi that field acquired resistance can still easily enter the human population. Unfortunately, azoles are used in clinical medicine in addition to being employed extensively in agriculture, where they are used to control fungal disease in crop plants and to treat intensively-reared farm animals. The compounds are widely deployed for crop protection; for example, over 250 metric tonnes of azoles are used to protect UK crops annually, and the global usage ranges into the thousands of tonnes each year (Kleinkauf et al., 2013). Aspergillus fumigatus is largely responsible for the increased mortality rates of invasive aspergillosis in immunocompromised patients. Aspergillus species are ubiquitous fungal saprotrophs worldwide and azole-resistant Aspergillus spp. can be isolated easily from the environment (Howard & Arendrup, 2011). Azole resistant aspergillosis in humans was reported in 2007 from the Netherlands (with over 90% of the clinical isolates employing the same resistance mechanism), and since 2007 azole-resistance in clinical isolates of Aspergillus has been reported from many other countries. These azole-resistant clinical strains may be a side effect of the use of azole fungicides in agriculture (Verweij et al., 2007; 2009), with such field acquired azole resistance jeopardising the effectiveness of using azoles to treat aspergillosis and other fungal diseases of humans (Verweij et al., 2016; Garcia-Rubio et al., 2017; Chowdhary & Meis, 2018). These observations serve to emphasise the urgency of the need to identify new fungicides that have targets distinct from those of the currently-available azoles. Significantly, the transcription factor that regulates ergosterol biosynthesis in fungi has recently been found to be unique, making it a new potential target for the development of novel antifungals (Yang et al., 2015; Sant et al., 2016; Gumber et al., 2017). Melanised walls are important to the survival and functioning of many plant pathogens and the azole fungicide tricyclazole (Fig. 11) inhibits melanin biosynthesis and is effective against fungal plant pathogens that require a melanised appressoria to penetrate the plant cell wall (e.g. Botrytis & Magnaporthe). edifenphos (Fig. 11) is an organophosphorus ester that is used as a fungicide in agriculture mainly to control rice diseases. Edifenphos is moderately toxic to man, being rapidly absorbed and able to cause liver, kidney and nerve damage. Metalaxyl (Fig. 11), an acylalanine fungicide, inhibits RNA polymerase I in Oomycota (Kingdom Chromista) such as the cause of potato late blight, Phytophthora infestans. Resistance to this fungicide commonly arises. Fig. 11. Structural formulae of the fungicides edifenphos (an organophosphorus ester), metalaxyl (an acylalanine fungicide, the (-)-isomer is illustrated here), and the melanin-synthesis inhibitor, tricyclazole. Among the most widely used and most effective classes of agricultural fungicides in the world today are a class of chemicals called strobilurins, which were first discovered in 1977, although the first useful products were not on sale until 1996. These are broad-spectrum fungicides, effective against a wide range of fungal pathogens. Strobilurins work by inhibiting mitochondrial respiration by blocking electron transport. This means that the fungus cannot produce energy so can no longer grow and eventually dies. Strobilurins are derived from a natural product so they are environmentally safe because they are rapidly degraded. The active ingredients of strobilurin fungicides are synthetic analogues of natural secondary metabolites known as p-methoxyacrylic acids, specifically: strobilurin A, oudemansin A, and myxothiazol A (Fig. 12). Fig. 12. The original (natural) strobilurins. Note the characteristic chemical structures: methoxy (CH3-O-) and acrylate (CH2=CHCOO−, which features a vinyl group, that is, two carbon atoms double bonded to each other and directly attached to a carbonyl carbon). Strobilurin compounds were discovered in the basidiomycete mushroom fungi Oudemansiella mucida, Pseudohiatula esculenta var. tenacellus (a synonym for Strobilurus stephanocystis) and Strobiluris tenacellus. It is counterintuitive to expect fungi to produce fungicides; as Balba (2007) puts it ‘…Many scientists excluded the idea of looking for fungicides in fungus…(sic)’. However, once Strobilurin A had been isolated from liquid cultures of the mushroom Strobilurus tenacellus the fungicides were found in culture filtrates of many other fungi, and with the benefit of hindsight we can understand why fungicides make a contribution to the biology of the producing organism by contributing to its competitive ability. Oomycota such as downy mildews. In 1992 the first artificial strobilurin fungicide was announced and was on the market in 1996. Strobilurins were so successful that by 1999 they accounted for 10% of the global fungicide market, reaching 15% by 2005. Because of their widespread use on cereals and soybeans, strobilurins are now the second largest group of fungicidal chemicals in use in agriculture, being second only to the triazoles. So, within ten years of their introduction to the market the stobilurins had surpassed all the older fungicide groups in importance excepting only for the triazoles (Sauter et al., 1999; Bartlett et al., 2002; Morton & Staub, 2008; Vincelli, 2012). by Vince Morton & Theodor Staub (both formerly of Novartis Crop Protection, now Syngenta). This is an APSnet Feature dated March 2008 (APS = American Phytopathological Society). Strobilurins inhibit respiration at a single unique site that blocks ATP synthesis (see below). This single site specificity raises the problem of potential resistance. Of course, the producing organisms are resistant to their own strobilurins, which itself illustrates that fungi can mutate to strobilurin resistance. Several resistant fungal pathogens have been identified in the field, and fungicide resistance affects Septoria diseases of wheat in Europe, and of turf in the US. In response, fungicide production companies are continually researching new strobilurins, developing mixtures with fungicides that have other active principles, and developing new methods of application, such as seed treatments. Strobilurins act by blocking oxidative phosphorylation in the fungal mitochondrial membrane. The standard pathway for NADH oxidation in mitochondrial respiration involves three protein complexes, I, III and IV. These complexes are involved in energy conservation by linking NADH oxidation and electron/proton translocation (ten protons per two electrons) with ATP synthesis. Strobilurins bind to the ubiquinone (coenzyme Q) carrier that carries electrons to the cytochrome b-c1 complex (described in Section 5.10). 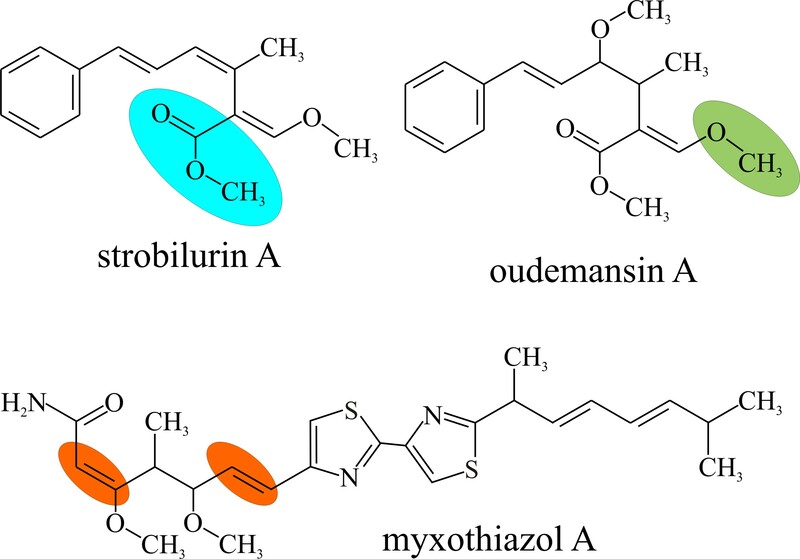 Fungi that produce strobilurins have a modified amino acid sequence in the binding envelope of the coenzyme Q protein that greatly reduces its binding affinity for strobilurin and make the strobilurin-producer strobilurin-resistant (Sauter et al., 1999). They are known as ‘Qo inhibitors’ (QoI), or Quinone Outside Inhibitors, because they act at the quinol outer binding site of the cytochrome b-c1 complex. The QoI group of fungicide families includes the strobilurins and two new families, represented by fenamidone (Bayer CropScience) and famoxadone (DuPont Crop Protection). The mode of action of QoI fungicides is unique to them. It has made them an important aid in research aimed at understanding the details of mitochondrial respiration, but they are also considered to be the most important recent development made in fungicides by the chemicals industry. The natural strobilurin products are not suitable for agricultural use themselves because they are volatile and unstable in the light. Many agrochemical companies invested in research to produce synthetic analogues of strobilurins, and related compounds (predominantly of strobilurin A due to its simpler structure for chemical synthesis), and a race to patent the first strobilurin fungicide ensued (Sauter et al., 1999; Bartlett et al., 2002). Chemical modification concentrates on improving photostability (diphenyl ethers improve stability) and reducing volatility (by adding benzene rings). Another concern is to improve the systemic properties of the strobilurins, to enhance performance and reduce application rates because of the active redistribution of systemic agents throughout the plant. There is considerable scope for variation in the strobilurin side chains, and this enables steady application of structural changes to improve product functionality. Table 8 shows the original strobilurin fungicides and their dates of release (and see Fig. 13). *Structural formulae are shown in Fig. 13. Azoxystrobin was discovered by ICI, the agrochemical interests of which are now part of Syngenta. Trifloxystrobin was discovered by Novartis and sold to Bayer in 2000. Data from Bartlett et al., 2002. Fig. 13. Structural formulae of commercial strobilurin fungicides (refer to Table 8). The effectiveness of strobilurins is highly dependent on the timing of application, especially on the stage of growth and its respirational demands. Pyraclostrobin and trifloxystrobin are very effective against Cercospora beticola on sugar beet; spore germination is effectively inhibited and spore production by diseased leaves is significantly reduced, both of these effects are due to the high demand for ATP during spore germination and development. There is much less inhibition of hyphal growth; this is presumably due to hyphae having different, and perhaps alternative, respiration demands. A commercial disadvantage of the mode of action of strobilurins is that their target site is in the universal pathway of respiration, yet the fungicides need to remain non-toxic to non-target organisms. Toxicity to animals varies between the different strobilurins, but strobilurins in general have been classified as having minimal risk to human health. Selectivity can be modified by manipulation of the chemical structure; and can be fine-tuned by control of dosage in the field. For example, the activity of Glomus coronatum mycorrhiza in five week old maize plants was unaffected by strobilurin treatment to the leaf surfaces at recommended commercial doses. There is evidence that strobilurin treated plants show positive physiological side effects that result in increased crop yields. In cereals an increase in biomass due to elevated carbohydrate synthesis and consequent increase in photosynthetic capabilities has been observed. Similarly, strobilurin treatment to control early blight in potatoes (caused by Alternaria solani) resulted in increased yield, greater tuber size and improved crop value. Generally speaking, these yield improvements following strobilurin treatments are higher than can be explained only by their fungicidal activity, and the response is not seen when non-strobilurin fungicides, such as azoles, are used. Development of resistance is an issue with all fungicides and the strobilurins are produced by fungi. Fungi that make the natural products have one of five single nucleotide substitutions in their cytochrome c gene that cause them to be unaffected by the compounds they produce. One of these substitutions is the causative mutation in many resistant pathogen mutants. However, the most damaging emerging resistance to strobilurins is associated with an alternative pathway that can bypass the strobilurin target site. Alternative oxidase (AOX) is a strobilurin-insensitive terminal oxidase which is present in many fungi. AOX accepts electrons directly from ubiquinol and acts as a substitute to the strobilurin target complex. Fungal AOX activity is inhibited by salicyl hydroxamic acid, but this also inhibits the plant AOX and is not a useful selective inhibitor. Resistance to strobilurins does not confer cross resistance to fungicides with different modes of action, like the azoles. But there are two recently introduced fungicides, famoxadone (a dicarboximide/oxazole fungicide that first went on sale in 1997) and fenamidone (an imidazole fungicide released for sale in 2001) that have the same mode of action as strobilurins and are susceptible to strobilurin resistance. The emergence of fungicide resistance is avoided (or at least minimised) by rotating fungicides with different modes of action in the field to ensure that specific fungicide chemistries are not overused. There is a Fungicide Resistance Action Committee (FRAC; view the URL http://www.frac.info/home) which recommends usage patterns and devises approaches that prolong the effectiveness of fungicides liable to encounter resistance problems and limits crop losses when resistance appears. ‘…The main resistance management strategies currently recommended are: avoid repetitive and sole use; mix or alternate with an appropriate partner fungicide; limit number and timing of treatments; avoid eradicant use; maintain recommended dose rate; integrate with non-chemical methods. Wherever feasible, several strategies should be used together...’ (Brent & Hollomon, 2007). You will recognise conceptual similarities between these Integrated Pest Management strategies recommended for control of agricultural crop diseases and the combinatorial antifungal therapies employed to manage human invasive fungal infections discussed in Section 18.3.